Removable mounting tabs hold tightly, yet remove easily, with no residue. Mount artwork, posters, signs, and more - they can be used on almost any clean surface. Tabs hold 2 oz per square inch. 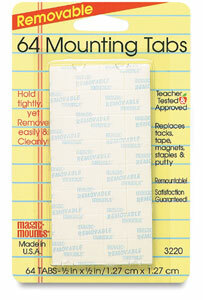 ® Magic Mounts is a registered trademark.